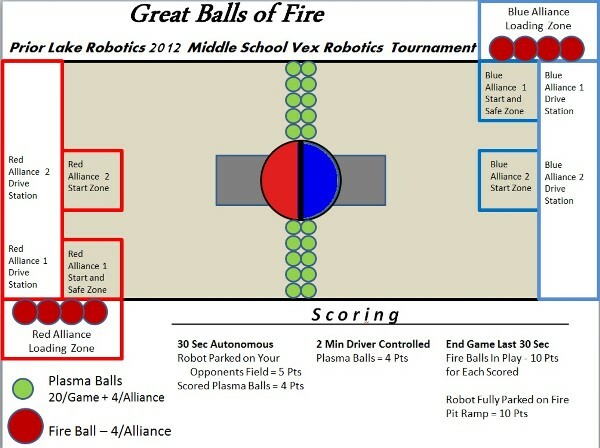 Prior Lake Robotics: 2012 Game Revealed "Great Balls of Fire"
1. Only Vex motors may be used on the robot for any purpose. 2. Non-Vex pre-built mechanism of any nature are prohibited. 3. At the beginning of all matches, maximum starting size of robot is 18” x 18” x 18” – may expand to any size after the start of any match. 4. Only Vex wheels may be used on the robot. 5. Team numbers must be displayed on two opposite sides of the robot with numbers at least 2” tall with 3/8” thick type face. 6. Every Robot will be required to pass a full inspection before being allowed to compete. 7. No sharp surfaces or edges are permitted on robot. 8. The following types of mechanisms and components are NOT allowed: a. Those that could potentially damage Playing Field components. b. Those that could potentially damage other competing Robots. c. Hose or string that pose an unnecessary risk of entanglement. e. Those that are designed to flip other Robots. 9. 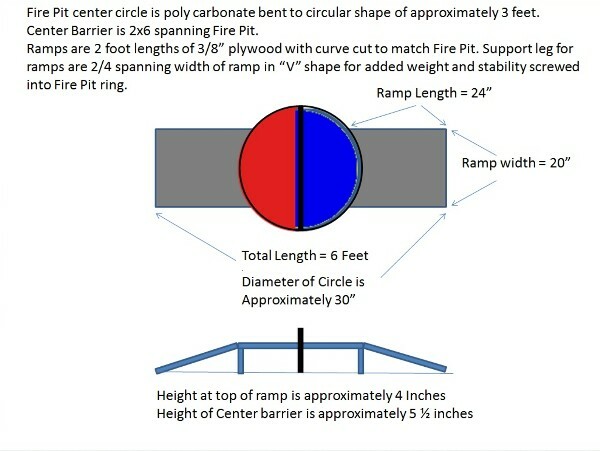 Non Vex structural building components may be used. 10. Tape may only be used for electrical labeling or attaching team numbers. 11. All robots require a flag holder to be installed on the robot prior to inspection. Holder must be able to accommodate a large straw as a flag post. 12. Only one supplied Vex battery may be used on the robot as the sole power supply for all power needs. 1. Each match will start with 20 Plasma Balls placed in the center of the field plus 2 preloaded per robot. 2. Each alliance will given 4 Fire Balls to be used in the last 30 seconds of each match. 3. Robots may pin another robot for 3 seconds and then have to back away 3 feet for 3 seconds. Penalty = 5 pts. 4. No intentional ramming of another robot. Penalty = 10 pts. 5. Scoring is done at end of autonomous period and end of game. 6. Fire Balls may only be placed on a robot from the loading Zone. 7. Human contact with a robot or the field is prohibited once a match has started. Penalty = disqualification of the team for that match. 8. Each drive team will include one driver, up to two coaches and one human player in the loading zone. 9. Only team members are allowed in the alliance stations. Interaction with audience members is strictly prohibited. 10. Scores will be calculated for all periods of a match at the end of each period when all game pieces have come to rest. 11. Strategies and mechanisms aimed solely at the destruction, damage or tipping over of an opponents robot are not in the Spirit of FIRST and are not allowed. However, this is a highly interactive game and inadvertent damage and tipping may occur. If the tipping or damage to another robot is deemed deliberate, that team will be disqualified for the match and if the action persists may be disqualified from the tournament.